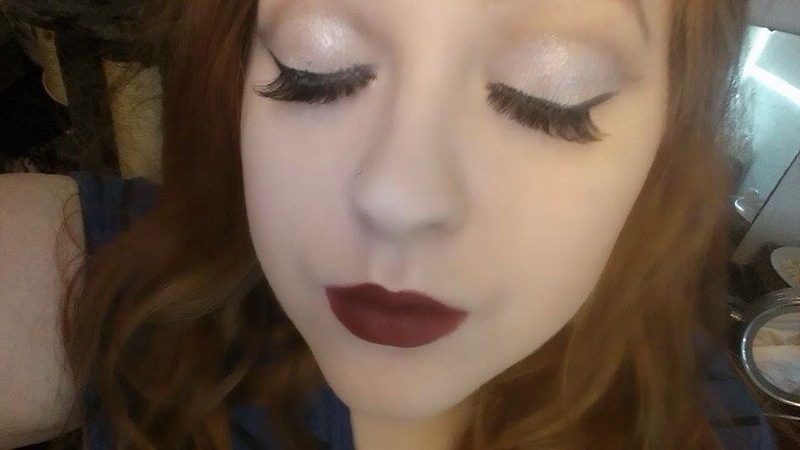 I know applying false eyelashes is a chore for most people and honestly it does take practice and determination, but once you get it right, it’ll make such a different to your makeup game. Sorry in advance about my horrible nails, as a veterinary nurse we cannot use nail varnish nor have nails longer than the tips of our fingers for hygene purposes. 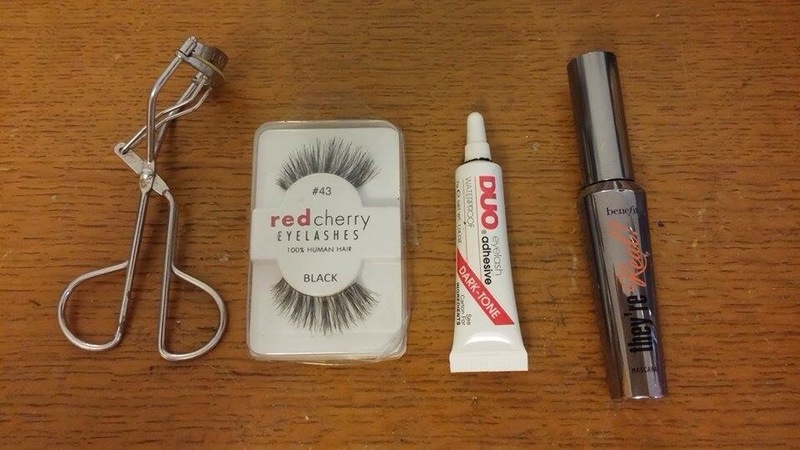 Eyelash curlers, eyelashes, eyelash adhesive, and mascara! 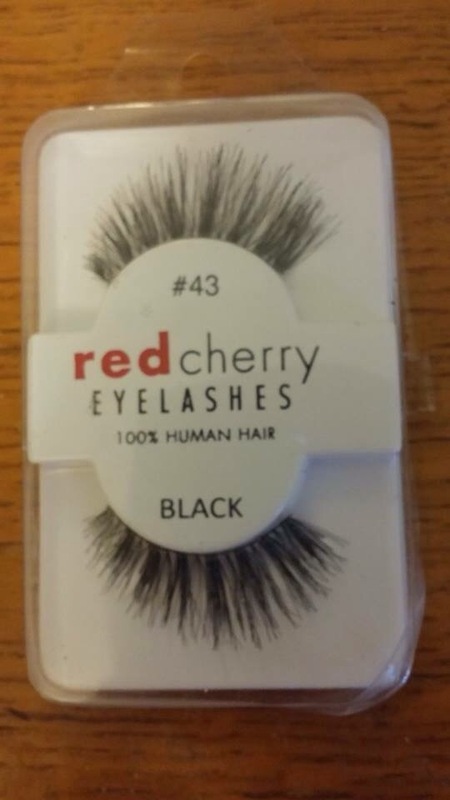 My eyelash curlers were a freebie from a makeup bag I brought once, the lashes are red cherry 43s, my eyelash adhesive is duo dark toned and my mascara is the benefit they’re real. 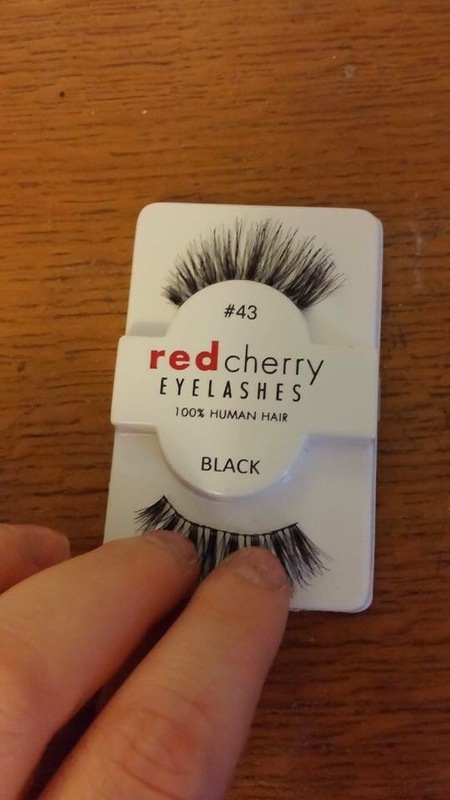 This involves selecting your eyelashes, in my case the red cherry 43’s are my all time favorite and fit my eyes perfectly. If your eyelashes do come a little bit long for your eyes just take a pair of scissors (most people use nail scissors for the accuracy) and trim a little bit off. 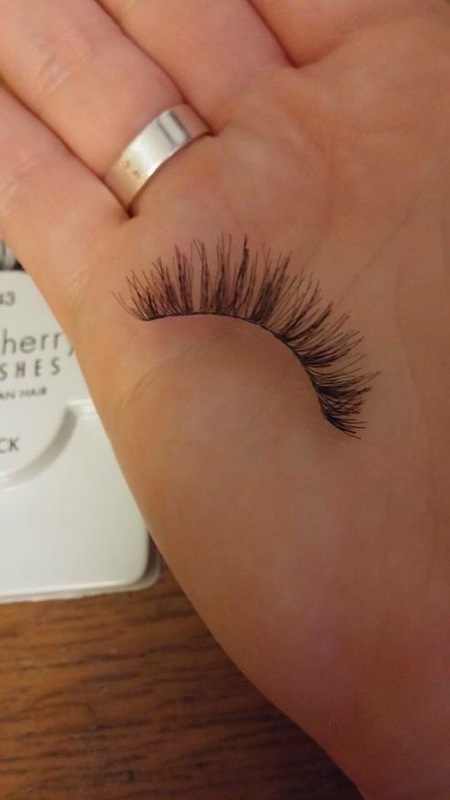 Remove the eyelash by pulling gently on them, not pulling the band as this can disfigure them. This step really help with the rest of the process, I call this rolling the eyelash. What I do is once I have removed the eyelashes from the case is to roll them, this is better demonstrated in the images below as I find it hard to describe this. I find that this helps with getting the correct shape for the eyelash to pop onto your eyelid. Again after doing this measure your eyelash against your eye to make sure that they are correct. Curl your eyelashes and apply one coat of your favorite mascara, it doesn’t have to be very volumising or lenghtening as you’re putting falsies on anyway. 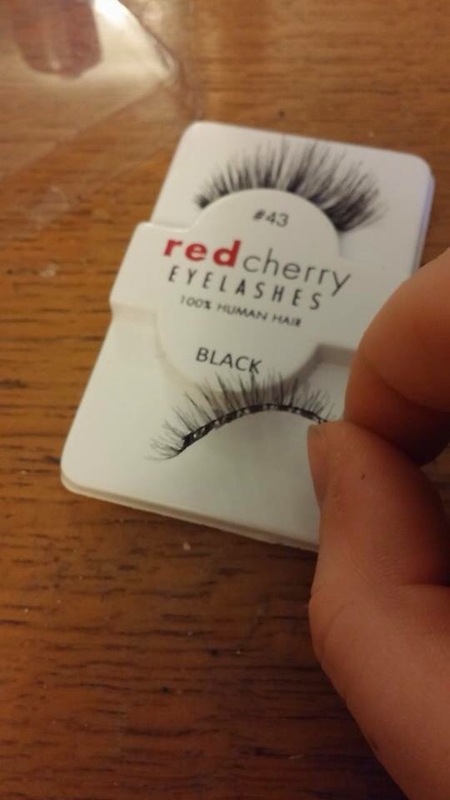 Apply the glue to the back of the lashes, I usually use a damp cotton wool bud as to not absorb too much of the product. 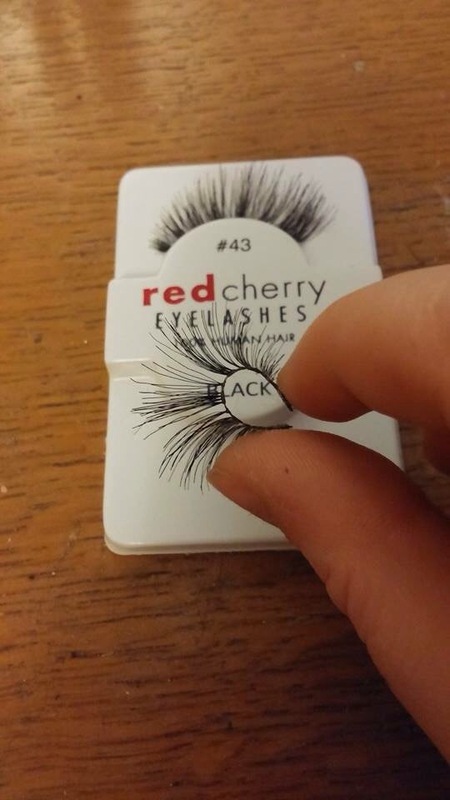 I find that personally I dont like to use the glue that comes with the eyelashes (if any does come with them) as its a bit pants rubbish, I use the duo lash glue in dark as most the time I am wearing lashes, I wear black eyeliner. If you are not the person to always wear black liner on your top lid, you could try the clear adhesive instead which drys clear and a little bit shiney. After applying the glue, I leave this for around 30 seconds without touching them to make sure that they get tacky and really sticky ready to apply to the lid. Applying the lashes, I don’t use tweaser for this but I know a lot of people that do but I think it’s just down to personal preferance, try and get the lash as close to your natural lash line andpush down. I hold the lash in my finger and thumb from both hands(one at each end) and pop it on, I press down for a couple of seconds and shazam done! 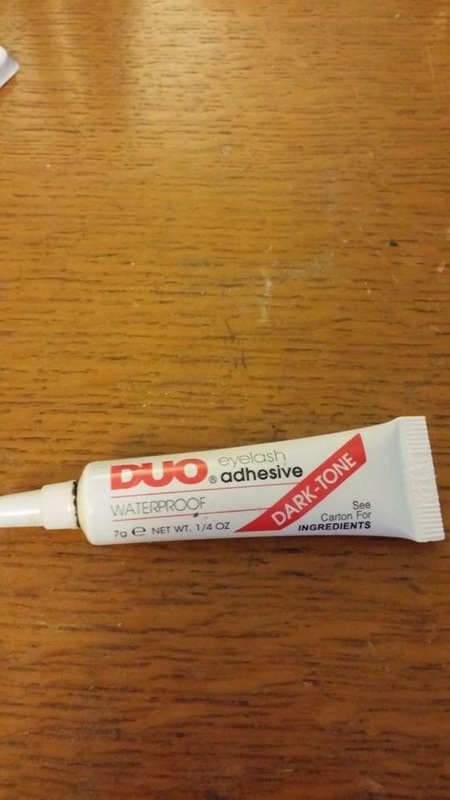 This step is totally optional, if you are using a clear glue and it ends up being a little bit too shiney for your liking, you can pat a bit of black matte eyeshadow using a thin flat brush on the top of the glue/lash line once it is totally dry. Now go bat your lashes at some men, ladies and creatures of your fancy! Next ›Makeup of the Day – Work Style!